My Catzee inspired fabric is off the loom. I think it looks pretty neat and am happy with it. I'm going to call it "Tortie Trails." This is the result of mixing the type and fiber content of my yarns. I used both mercerized and unmercerized cottons, and rayon. 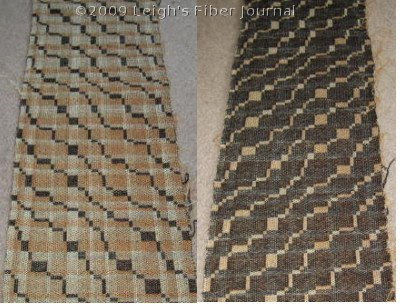 As a design element, this is referred to as "differential shrinkage," where the different yarns shrink at different rates as a result of wet finishing. My problem is that differential shrinkage is not really my "thing." I find traditional methods and effects personally more appealing. I love it! Leave it as is. Yuk! Iron it out, quick! I've not tried a poll like this before so I'm not sure how this will work. I am interested in your opinion, so this may be a fun way to see what you all think. I like the result, it makes the surface more interesting. But you should do what you think will be best. well, you asked me what *I* think, and I love it, so that's how I voted. But I also think it's *your* weaving,and you might be well served by documenting what's happened - then pressing it into submission. ;) I think it's lovely fabric either way, by the way, and I love the Catzee-based inspiration, too. I have to agree with yarninmypocket. It is a lovely fabric either way, and I'm biased by the fact that I'm playing with differential shrinkage at the moment. But I have to say that the lovely bumps and wobbles make it look more like the soft fluffy corves of a cat to me. Yes, I voted I loved it. I like the almost 3 dimensions of it. But I probably would want to see how it looked ironed out too. You got pretty good differential shrinkage without even intending to. Happy creative accident? Can it be ironed into submission? What do you plan to use the fabric for? The fabric is beautiful, even while it's not what you intended. I think it looks great either way! The differential shrinking effect is very interesting, and has become quite popular in Scandinavia. I love how it looks! What a fun pattern it turned out to be. P.S. Look at my blog a picture of my loom is on it! I've been playing around with differential shrinkage in my recent samples. In fact, it's why I got the silk/rayon yarn from Tim at Hawthorne. So I look at your scarf as a happy accident. after all it is catzee inspired - and the differential shrinkage effect looks like something cuddly one of my 4 cat(zees) would just love to curl up in (as opposed to a perfectly flat piece of fabric). although i must say, my cats would love to lay claim to anything that i devoted that much attention to! Catzee isn't very lumpy. She is smooth and sleek. If you stick with the inspiration of Catzee, I think you might want to iron it. You might want to think about what you're going to do with it. If you're using it as a runner it should probably lay flat. Either way the colors and pattern work very well together. In reading ya'lls comments, I realized that I've never appreciated differential shrinkage because I can't "see" ways to use it. You all have my imagination in gear now however. This sample is 10.25 by 87 inches. 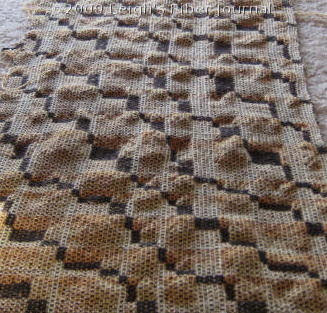 It was woven for a sample exchange, for which I need to cut 20 samples from it. That will take up a good bit of it. Consequently I didn't worry about weaving in the weft ends and left them hanging out of the selvedge when I changed color. My idea was perhaps vest fronts with the leftover fabric, but I can't see a vest with bubbly fabric like that. A scarf I can see though, so I may try this again in a different width and with different colors. There's a award for you in my blog, I hope you don't mind. You can pick yours up at your convenience. Charlotte and MiniKat, thank you! Lynette, that is an excellent point. I think I would like to try this again, but without color patterning. It would be interesting to see if I can get somewhat controlled results, too.